My name is Fr Richard Nesbitt and I have been the parish priest here at Our Lady of Fatima since April 2013. I am very honoured to be only the fifth parish priest here in White City since the parish was founded in 1955. I have felt at home here since my very first visit about ten years ago when I was a seminarian and I came to visit my friend, John McKenna, who was spending his pastoral year here and who was later ordained priest here at Our Lady of Fatima in 2006. I was immediately struck, as so many people are, by how welcoming and warm the community is here. It reminds me so much of the parish where I lived for 10 years in Poland and where I was received into the Church at the grand old age of 28. I was born in Edinburgh and then moved down to England with my loving family, but as I grew up I was never involved in any faith community. It was only when I went to Poland in 1989, just when everything was changing after the fall of Communism, that I had my first contact with the Catholic Church. I taught English in schools, offices, colleges and people’s homes and came to understand very quickly how much their faith meant to people. It gave their lives a meaning and a centre which I knew I didn’t have. God led me to a friendly and vibrant local parish community, much like our Lady of Fatima, where everyone helped me, step by step, to come to know and love God and his Church. There is that wonderful African saying that it takes a whole village to raise a child - well, it took a whole parish to bring me to faith! Pope (now Saint) John Paul II visited his homeland every couple of years and inspired me with his extraordinary faith and courage. Those ten years in Poland changed the whole direction of my life and led me back to England in 2001 to join Allen Hall seminary to train for the priesthood – something I could never have imagined myself doing when I was younger! I loved my time at seminary and was able to experience being a Catholic in my own country for the first time. I had never imagined myself living in London when I was younger – it all seemed too big and fast for me – but I came to understand that London is made up of many smaller communities and that these are full of people many of whom, like myself, don’t come from here but who have now made London their home. I think I can now say wholeheartedly that I love London! I was ordained in 2007 and was sent to the wonderful parish of Our Lady and St Joseph in Hanwell, where I was blessed to serve as part of a great parish team under the leadership of Fr Bernard Scholes. I love parish life with all of the extraordinary things of ordinary daily life. As in Poland, I was blessed with a wonderful parish community who helped me to grow and to grow with them. In 2009 I was asked by Cardinal Vincent to become the Vocations Director for Westminster diocese, which is a huge honour. Although this meant that I had to leave Hanwell to be able to concentrate on this new role, I had a very strong sense that this was what God was calling me to do. Just as so many different people have helped me to grow in my faith and discover God’s plan for my life, so now I am given this very humbling honour to help others on their journey of seeking how to become deeper disciples of Jesus Christ. I journey with men and women, one to one, in prayer groups and retreat days, helping them to hear God’s voice in their lives and then to respond to His calling. I have a particular responsibility to guide those men in our diocese who sense that God may be calling them to the priesthood. In April 2013, I was asked if I could come to help out at Our Lady of Fatima for a few weeks after Fr Keith Stoakes, who had been parish priest here for 12 years, was moved to Poplar in the East End (the parish where he himself was baptised, confirmed and eventually ordained as priest!). I think I knew after the first weekend that I wanted to stay! And so it was a huge joy when Cardinal Vincent officially asked me to become the parish priest at Our Lady of Fatima. I almost kissed him! I give thanks to God every day for this opportunity to serve in this great parish. I am humbled by the faith, kindness and great love of the Lord of our parishioners. We are also blessed with a truly wonderful primary school – Pope John School – which brings so much life to our parish community. Together we really are at the heart of the White City. Fr Ephrem was born in Addis Ababa in Ethiopia to a family originally from Eritrea. In Ethiopia only about one percent of the population are Catholic, the predominant religions being the Orthodox church and Islam. Raised in a Catholic family he was particularly influenced by his mothers devotion and faith. The children were always expected to go to mass, they were able to decide which of the services they would attend but it was expected that they would definitely go! During his teenage years Fr Ephrem always attended church, but any boyhood ideas of the priesthood had disappeared as he felt unable to face all the challenges. One of the most formative times of his life was when he was at university studying accountancy. At the cathedral there was a Youth Group which proved not only to have a powerful influence on his own life but on five other young men, who all who all went on to join the priesthood. In fact the practice of the Youth association became the pattern for all parishes in the diocese. The association held many beautiful celebrations and special youth masses. Father Ephrem belonged to the choir which frequently practised together not only singing but praying and studying scripture. Gradually Fr Ephrem found that he was spending more and more time working for the church. He used to ensure that all of his studying was completed on a Friday evening so that he was free during the weekend. Saturday was spent with the choir, not only practising the music, but spending time sharing faith together, reading the bible and praying. Saturday evening was reserved for the Sacrament of Reconciliation which was celebrated on a weekly basis. On Sunday morning the youth would gather early before the mass started at ten o'clock. As many people would not have eaten for some time before mass afterwards it was back to the hall for tea and bread and the Youth meeting, sometimes with guest speakers. The different committees would speak about what they had achieved during the week. Afterwards if there was anyone in the community in need of help they would be visited. It was a very powerful ministry, touching and transforming people's lives, all of the youth looked forward to spending this very beautiful time together. Fr Ephrem feels that it was that involvement that prepared him for the priesthood. From his group of fourteen close friends came four priests. In total there are six men from the youth group who became priests and one religious sister who has taken her final vows. It was during a retreat organised by the group that Fr Ephrem really a major conversion of heart, a calling to a life more deeply devoted to prayer. The retreat was in the form of a Life in the Spirit seminar and the group returned transformed by their experience. Suddenly they were not satisfied with anything they were doing. The group felt a particular devotion to spending time together in prayer and reading the Gospel. Upon his return Fr Ephrem slowly resumed his way of life. Sometime after this, whilst playing football Fr Ephrem fell and fractured his leg very severely. This entailed a months stay in hospital and a further five months at home. He really missed the services and hid life, but also realised that he had spent a great deal of time rushing everywhere, to university, to the youth group and to the church. He was forced now to be still. There was little to do except read, and he did so with an open heart. He read two books that particularly touched him; 'Youth with a Mission', a book about people who were missionaries and one about St Francis of Assisi. Both of these books faced him with a direct challenge, 'What am I doing here?' He decided at that time that the priesthood was for him. He had not yet graduated but decided that when he had and was well and free of the crutches that he would join a religious community. 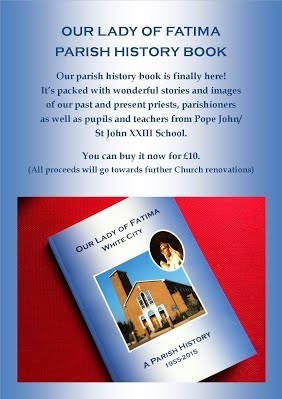 PARISH HISTORY BOOK is still available! Our beautiful Jubilee Year history of the parish and Pope John/St John XXIII School has 144 pages of wonderful reflections and stories from our various parish priests, head teachers & parishioners, packed with fantastic photographs throughout. Copies are £10 each to cover costs and raise a little bit of money for parish funds – our fundraising focus in 2016 will be to pay for the renovation of the current school hall when it becomes our new parish centre next autumn.